Charles Ellis "Chuck" Schumer (born November 23, 1950) is the senior United States Senator from New York and a member of the Democratic Party and the Senate Minority Leader. Before his election to the U.S. Senate, Schumer served in the United States House of Representatives from 1981 to 1999. He represented New York's 16th congressional district, which was later redistricted to the 10th congressional district in 1983 and to the 9th congressional district in 1993. In 2015, Senate Minority Leader Harry Reid of Nevada announced his retirement. Reid quickly supported Schumer to replace him as the new Senate Minority Leader. On November 16, 2016, Schumer was elected as the senate's new minority leader. He assumed this position on January 3, 2017. Schumer was born on November 23, 1950 in Brooklyn, New York. His family is Jewish, descended from immigrants from Russia, Poland, and Austria. He studied at Harvard College and Harvard Law School, he was a three-term member of the New York State Assembly, serving from 1975 to 1980. Schumer is married to Iris Weinshall. They have two children. ↑ "schumer". Freepages.genealogy.rootsweb.com. Retrieved March 18, 2010. 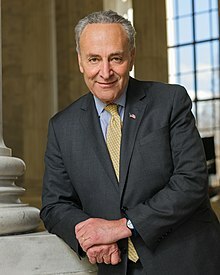 Wikimedia Commons has media related to Charles Schumer. This page was last changed on 2 January 2019, at 15:57.